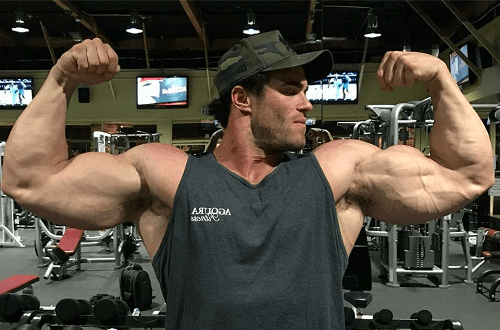 Is Calum Von Moger natural? Let’s find out. Calum Von Moger’s physique is a combination of old-school aesthetics and modern size. His crazy muscularity, impressive definition, and classic proportions are extremely rare to come by. As far as Calum’s stats go, there are only a few measurements out there that also appear to be dated. We decided to include them in the article for informational purposes, but they should –in no way- reflect what his physique measures at its best. Before Calum Von Moger became the iconic persona that we all know today, he was just a young kid with a deep passion for bodybuilding. Calum grew up in a small town in Australia and was skinny growing up. By the time he turned fourteen, he decided to join a gym in an effort to imitate his older brother; who was both bigger and stronger than him at the time. It didn’t take long before his enormous potential became apparent and it was clear that he had a talent for lifting weights and building muscle. In 2010, he competed in his first-ever bodybuilding competition, and by 2014 he had secured the overall win at the WFF Mr. Universe. With that being said, it wasn’t until 2013 -when Mad Desire was published- that the world would finally catch a glimpse of the rising bodybuilding sensation. Mad Desire is a short bodybuilding video that captures Calum’s journey, leading up to one of his competitions. In the short production, the young Australian also shares his thoughts on the modern state of bodybuilding. The video catapulted him into stardom as people couldn’t help but notice his impressive resemblance to Arnold Schwarzenegger. Calum took full advantage of his newly-found fame and decided to move to California, in an effort to further his success. At only 28 years old, he has already been featured in several magazines and movies – recently playing Arnold Schwarzenegger in a biopic titled Bigger. He also owns two fitness-related companies; one that focuses on supplements and the other on apparel. In an effort to obtain professional status in the IFBB, Calum’s bodybuilding career was shockingly placed on hold in 2017. While attempting a two-man barbell curl with classic physique competitor, Chris Bumstead – Calum ended up tearing one of his biceps. After undergoing surgery and therapy, the bodybuilding sensation would go on to tear the bicep once more, after attempting to rappel down a cliff. During this accident, he would also tear his patella. Sadly, both injuries required surgical intervention and placed him outside the gym for an extended period of time. As of today, Calum is undergoing physical therapy and is already looking forward to rebuilding his physique. We are confident that he will be back to normal in no time and will hopefully make his way to a bodybuilding stage in the near future. It isn’t a big secret that Calum is extremely popular on social media. It’s also very common to see a lot of aspiring bodybuilders in the comment section asking about Calum’s natural status. If you’re one of those people that often wonder how Calum Von Moger built his physique – you’ve come to the right place. Let’s start off by stating the obvious. Calum Von Moger holds one of the best physiques in the modern age of bodybuilding. He also moves a lot of weight at the gym and walks around at a very low body fat percentage. These facts alone would lead most people to believe that he isn’t natural. Calum has never claimed to be natural and has actually hinted on several occasions to not being so. Although he likely isn’t natural, his impressive physique is ultimately the result of years of proper nutrition, an unmatched work ethic, and amazing genetics. Disclaimer: We do not own the images used in this article. They were taken off social media and belong to their rightful owners. If you are the owner of these images and wish to have them removed, please let us know by using the contact form on the website. ← Is Eva Andressa Natural?